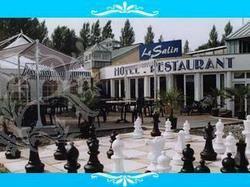 Le Salin Hotel is located on the motorway between Granville and Coutances, beside Granville Beach. It offers modern guest rooms, and a garden with a mini-golf course. The Salin offers guest rooms fully equipped with a flat-screen TV with satellite channels, and free Wi-Fi connection. Each room has a private bathroom. The restaurant serves some of the region's best meats and sea products in a nautical-themed dining room. Just 4 kilometres from the beach and 60 km from the Mont-St-Michel, Le Salin Hotel is also close to Granville's casino.